Victorian Snowglobe, Story House, Tree with Music. Sleigh rides and snowman building. Gentle flurries swirling from the sky. Gracious homes all decorated and lit from within. And in the distance, the rumble of a train bringing family and friends back home for the holidays. These are memories and moments that make this season of harmony and joy so special. Now you can reflect upon the place they hold in your heart with the Thomas Kinkade Journey Home for the Holidays Snowglobe, a first-ever exclusively from The Bradford Exchange. Enhanced by lights, music and a rotating train, this winter snowglobe embodies the joy of the holiday season. Individually hand-cast and hand-painted in fully sculpted detail, this Thomas Kinkade snowglobe boasts an abundance of specially designed features. The crystal-clear snowglobe is topped by a silvery star and houses a miniature village inspired by the holiday art of the Painter of Light™. The church on the hill and both Victorian homes light up from within at the touch of a switch as a built-in water pump keeps snow swirling all around the village. Your snowglobe sits on a snow-covered landscape with pine trees, encircled by a railroad track. A miniature green and red steam train circles around the track, in and out of the tunnel carved into the mountainside while a a medley of 8 holiday carols fills the air. Presented upon a wood-toned base with a golden title plaque, it's sure to become a treasured part of your Christmas traditions, but strong demand is expected for this limited-edition treasure. Hurry - order now! Sparkling snowmen enjoy their holiday season most when it's extra cold, with scarves and mittens and snug-fitting hats being a necessity as much as a fashion statement. But, when it comes to holiday hugs and loving embraces, snowmen, just like the rest of us, prefer them extra warm. Now, experience the warm embraces of festive snowmen with the limited-edition Thomas Kinkade Hugs for the Holidays Sculpture, a Crystal Masterpiece Edition exclusively from The Bradford Exchange. Combining a faceted crystal snowman sculpture with lights, music and a miniature village sculpture, it sets the perfect scene for the most joy-filled holiday ever.Handcrafted in intricate detail, this crystal snowman and snowwoman sparkle with the classic cuts and prismatic reflections of the finest genuine crystal. Their blowing scarves and mittens along with gift boxes are richly enhanced with silvery plating. Nestled within the sculpture, you'll discover a hand-cast and hand-painted Thomas Kinkade holiday village capturing all the details of a classic holiday scene. The gracious Victorian homes also illuminate from within at the touch of a switch. Providing a festive contrast of color, two cardinals have joined the fun, their celebratory red coats matched only by the metallic ornaments trimming the flocked, frosted boughs of the magnificent Christmas tree. And, at the touch of a switch, the naturally soft-textured tree illuminates with fiber-optic color-changing lights. For the final touch, at the press of a button, you'll hear a medley of 8 classic carols begin to play. Presented on a wood-toned base with a silver title plaque, strong demand is expected for this sculpture, so don't wait. Order now! Rosy cheeked and smiling, Santa has turned his attention to filling an assortment of holiday stockings for a very special family: yours! Now, capture the moment "the stockings were hung" in your home by Santa with a sculpture enhanced by glowing light and the holiday art of Thomas Kinkade, the Painter of Light™. Introducing the Thomas Kinkade Stockings Were Hung Personalized Sculpture, a first-of-a-kind limited edition available exclusively from The Bradford Exchange. 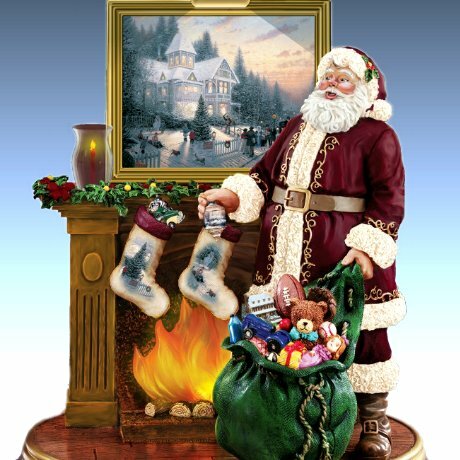 This warmly illuminated Thomas Kinkade Christmas sculpture includes up to 6 sculpted stockings personalized with names for a truly personal holiday heirloom.This charming Santa sculpture is fully sculpted, handcrafted and hand-painted in delightful detail, from his holly-rimmed hat to his overflowing bag of toys. Thomas Kinkade's beloved artwork is reproduced in a miniature framed portrait above the mantle, where you can hang your customized stockings featuring your loved ones' names. At the press of a button, the tree, portrait light and fire all illuminate as a medley of 8 holiday songs play! It's a truly enchanting Thomas Kinkade Christmas masterpiece your family is sure to cherish for years to come. Eager demand is expected for this limited-edition sculpture, so don't wait to personalize yours - order now! The wondrous spirit of the holiday season takes many forms: a snowman's jolly smile, a glowing Thomas Kinkade Christmas painting, perfectly wrapped gifts beneath the tree, the clatter of reindeer up on the rooftop, and now this sparkling crystal snowman! Introducing the Thomas Kinkade the Gift of the Holidays Sculpture, a dazzling illuminated and musical treasure exclusively from The Bradford Exchange. With its softly glowing light and cheerful repertoire of Christmas songs, it's the perfect way to make the radiant artistry of Thomas Kinkade a special part of your holiday celebrations. A Christmas decoration that is sure to take center stage in any room, this limited-edition crystal snowman is individually handcrafted of multi-faceted genuine crystal and finely sculpted artist's resin. A gleaming silver luster adorns the snowman's mittens, scarf and shoes, as well as the gift box top with its festive bow. And what a surprise waits inside! Rising on a sparkling crystalline trail of holiday magic, a hand-painted sculpture of Santa and his sleigh takes off for its appointed Christmas Eve rounds, while a medley of 8 beloved Christmas carols fills the air. Even the gift box is a joy to behold, glowing with light from within and showcasing one of Thomas Kinkade's most beloved holiday artworks. Strong demand is expected for this premiere Thomas Kinkade crystal snowman, so don't wait. Order now! Treat your family to a home filled with the heartwarming pleasures of a Thomas Kinkade Christmas! 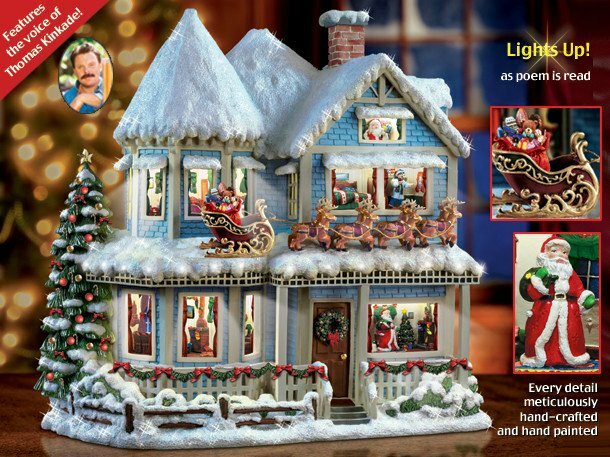 Now, in a unique collectibles market first, Thomas Kinkade artwork is magnificently reproduced in a charming illuminated Santa figurine collection beginning with Issue One, Light of Christmas. Soon your collection will grow with Issue Two, Joy of Christmas, and additional Santa figurines, each a separate issue to follow. Available only from The Bradford Editions, each Thomas Kinkade collectible Santa figurine in the collection is finely handcrafted and intricately detailed, featuring Santa in cozy vignettes filled with the joys of the season - warmly lit fireplaces, extravagantly decorated Christmas trees, and, or course, a handsomely framed and lit Thomas Kinkade painting. They're sure to be immensely popular, so don't miss your chance to show off this unique Christmas decoration idea in your home - order now! The telling of the Nativity story and arrival of Santa Claus on Christmas Eve are among our most beloved holiday traditions. Now you can celebrate the joys of the season and the true meaning of Christmas with this first-ever narrative Santa figurine by renowned artist Thomas Kinkade. This masterpiece features the artist's own voice sharing a new vision of what the season is all about, available exclusively from The Bradford Exchange.Exquisitely handcrafted in artist's resin and meticulously hand-painted for lifelike details, this charming collectible features Santa at work carving a Nativity. A faithful recreation of Kinkade's famed "Victorian Christmas II" hangs above a fireplace behind Santa and illuminates for an inspiring finishing touch. Be among the firsts to hear Kinkade's own voice as he narrates the Christmas Story in a market first. Strong demand is expected. Order now! Fill your home with warmhearted cheer with this "So Real" Thomas Kinkade Santa Claus figurine! This first-ever limited-edition collectible Victorian Santa figurine is a Bradford Editions exclusive, beautifully handcrafted and inspired by the holiday art of Thomas Kinkade.You'll be amazed by just how lifelike this Santa seems! Take a look at his kindly face, soft beard, and rich, faux fur coat and hat. See how he adjusts his wire-rimmed spectacles as he reviews his list of good boys and girls? He's even carrying a stocking decorated in festive holiday colors and filled with hand-painted toys and gifts. What a unique Christmas decoration idea! But don't wait to invite this Santa to your home - he's expected to be in high demand! Order now! Whatever our age, wherever we are - Santa Claus is a beloved sign of the holiday season. Now you can celebrate jolly Saint Nick with this first-ever illuminated Thomas Kinkade Father Christmas figurine, available exclusively from The Bradford Exchange. Exquisitely handcrafted, this sparkling white Santa Clause figurine features Saint Nick in a striking overcoat lavished with plush faux fur. Intricate hand-painted and illuminated buildings, a skating pond, cheerful villagers and much more decorate his festive coat in 15 charming sculptural village scenes. Plus, Santa's big bag of toys, mittens, snowy-white beard, frosty Christmas tree and illuminated golden lantern all add more holiday delight! High demand is expected for this elegant limited-edition treasure. Order now! For the FIRST TIME EVER, watch and listen as every meticulously detailed room in this extraordinary Thomas Kinkade collectible story house comes to life with light and sound! Thomas Kinkade narrates the beloved "'Twas the Night Before Christmas" poem, and as the story progresses each room in this glorious snow-draped Victorian house fills with light, revealing handcrafted and hand-painted scenes and figurines! Look, there's Santa in the parlor, and his reindeer and sleigh are waiting on the roof! You'll love watching the rapt expressions of your family and friends as they experience this exclusive limited-edition Thomas Kinkade collectible story house, "The Night Before Christmas," from Hawthorne Village. It's destined to become a treasured Christmas decoration, an heirloom to be enjoyed by generations of family gatherings. Strong demand is expected, order now! In a quaint Thomas Kinkade village, merry Christmas revelers gather 'round a brightly-lit tree in the heart of town, singing cheerful carols while an old-fashioned train circles nearby, a nostalgic reminder of seasonal family travels. Now, the Thomas Kinkade Reflections of Christmas Tabletop Tree brings together all of those fond holiday memories in a Masterpiece Edition FIRST, only from The Bradford Exchange. Alive with color-changing lights, music and action, this breathtaking crystal tabletop tree is clearly unique, and instantly ready to bring the big-time festivities of a small-town Christmas into your holiday home.This one-of-a-kind Thomas Kinkade tabletop tree is superbly handcrafted with sparkling, faceted genuine crystal and hand-painted for intricate detailing. Hidden within the crystal tree are long-lasting LED lights that light up the tabletop tree with vivid changing colors that dance on the boughs of the tree and spread a festive glow across the fully dimensional sculptural Thomas Kinkade village that surrounds the base. Then, at the press of a button, an old-fashioned miniature train circles around the tree to a delightful medley of eight favorite Christmas carols. Very strong demand is expected for this limited-edition Thomas Kinkade tabletop tree, so don't delay. Order now! The memories of Christmas are timeless treasures that fill our hearts with cheer. During the Christmas season, the holiday spirit is everywhere you look. Now, the beloved Christmas artistry of Thomas Kinkade inspires a sculpted village scene at the center of a beautiful floral arrangement. Introducing the Thomas Kinkade Holidays Bring You Home Table Centerpiece, a first-ever Always in Bloom® rotating train centerpiece exclusively from The Bradford Exchange. Enhanced by lights, music and a rotating train, this village centerpiece is imbued with the spirit and joy of the holiday season.In the middle of this everlasting floral arrangement of Always in Bloom® handcrafted flowers and greenery, a fully sculpted and hand-painted miniature village brings three buildings from Thomas Kinkade's holiday art to life. At the flip of a switch, the village and a sparkling star topper glow with light as a medley of 8 holiday carols plays and a real working train circles around the scene. LED lights shine throughout the seemingly alive arrangement of seasonal poinsettias, holly leaves, greenery and pine cones. It's an interactive work of artistic wonder that is sure to become part of your Christmas table decoration traditions for years to come, but strong demand is expected for this limited-edition treasure, so hurry - order now! No other artist captured the charm of Christmas quite like Thomas Kinkade. Through the windows of one of his gorgeous Victorian homes, we can almost see the warm glow of a brightly lit table set with a beautiful floral arrangement. Now, a first-ever Thomas Kinkade table centerpiece brings that vision to life like never before, combining lush silken flowers and 3D village sculpture in an Always in Bloom® exclusive from The Bradford Exchange. Enhanced by glowing lights and festive music, this Thomas Kinkade Christmas centerpiece truly shines with the warmth and joy of the season!In the middle of this floral holiday centerpiece, a never-before-seen grouping of favorite Thomas Kinkade homes is recreated in handcrafted, hand-painted sculptures that light up from within as a medley of 8 holiday carols plays. This captivating village scene is nestled amid a festive arrangement of lifelike flowers that are individually hand-made from a silky-soft material. Lifelike red roses, delicate white blossoms, green holly leaves and snow-white baby's breath are accented by miniature red berries, pinecones and evergreen, while a sculpted bow inscribed with "Home for the Holidays" ties it all together. The edition is limited and strong demand is expected, so hurry - order now!